Here is my winter project. 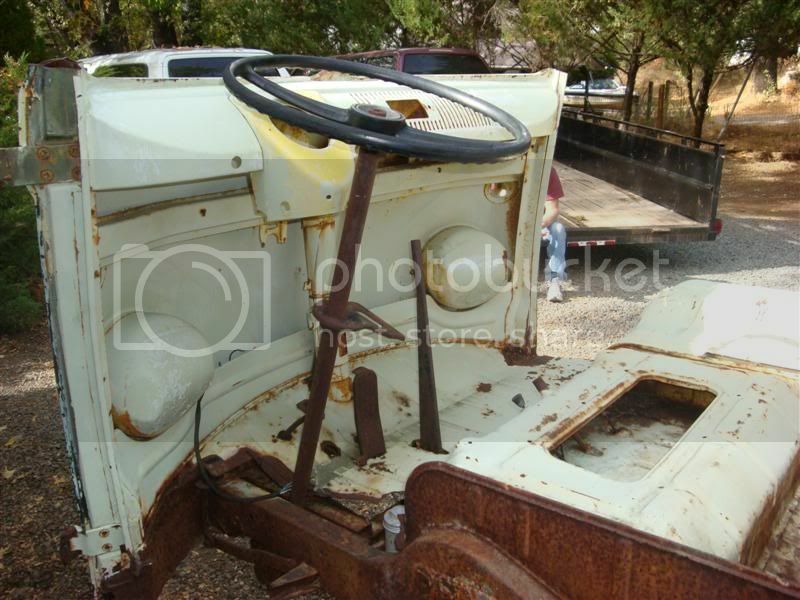 1958 Pressed bumper PG/SG walk thru formerly a 4 wheel drive monster bus. I purchased this bus from another samba member and bus collector he purchased the bus some time in the 90s as a customized jeep bus. 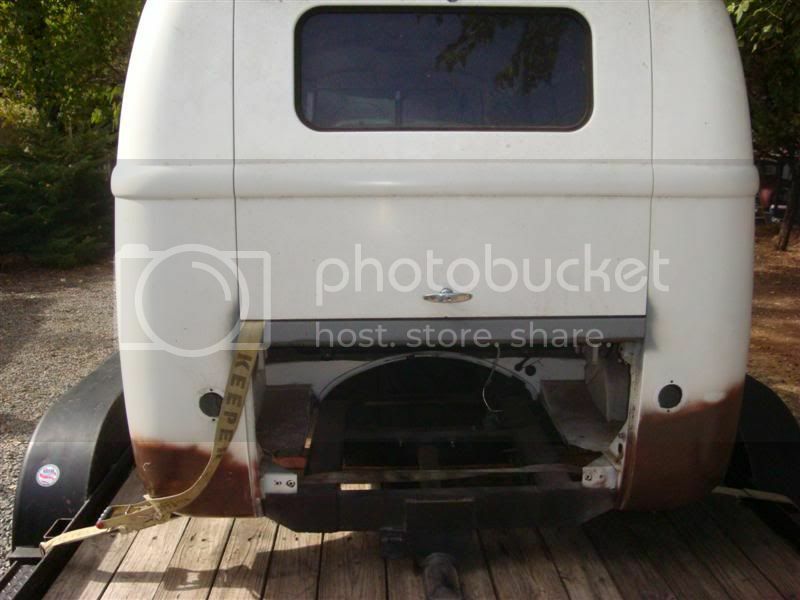 This bus had solid axles front and rear with leaf springs and 4 speed trans and transfer case with a Buick v6 engine cut right into the middle of the cargo floor. 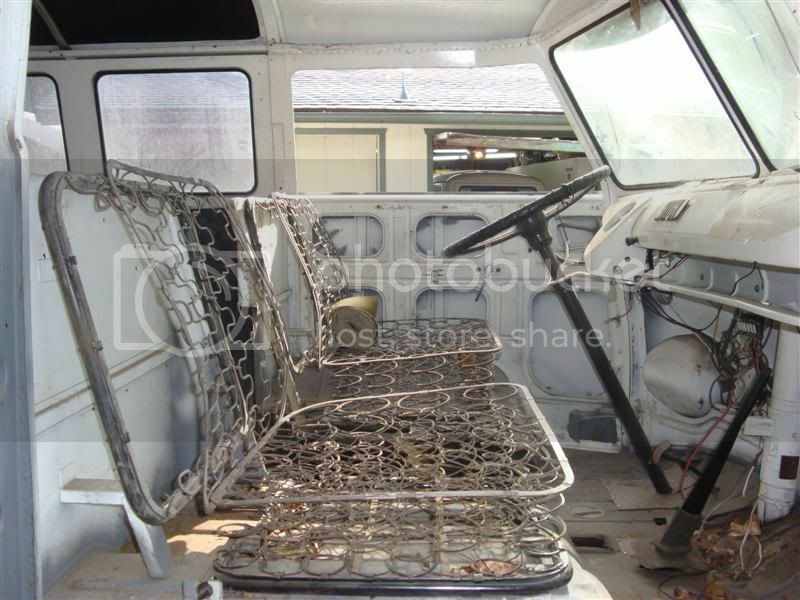 All of this was bolted to a completely custom boxed steel frame that had been welded to the buses original frame. The time that this person put into converting this bus was substancial and was built very well unfortunatly the bus was cut in many areas to accomidate its new running gear leaving the bus in sad shape. 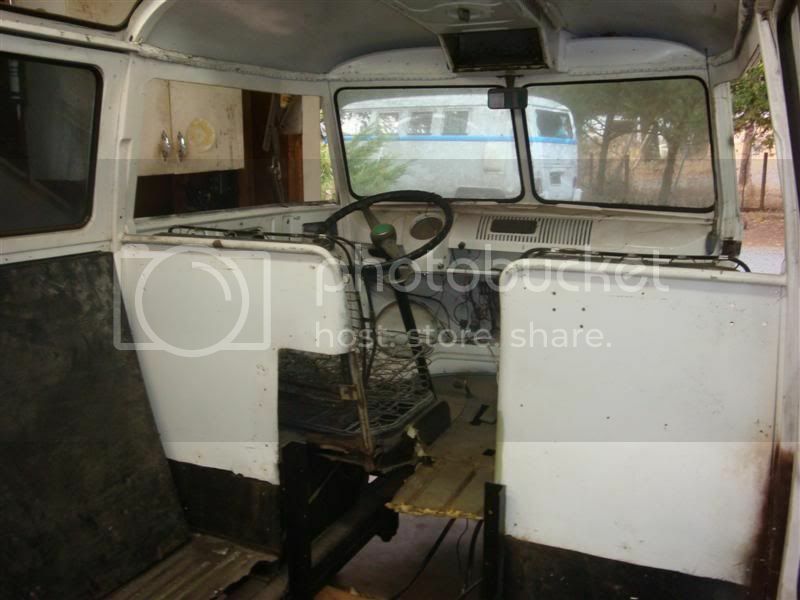 when I purchased the bus the PO had already removed everything but the custom frame so this is where I have started. 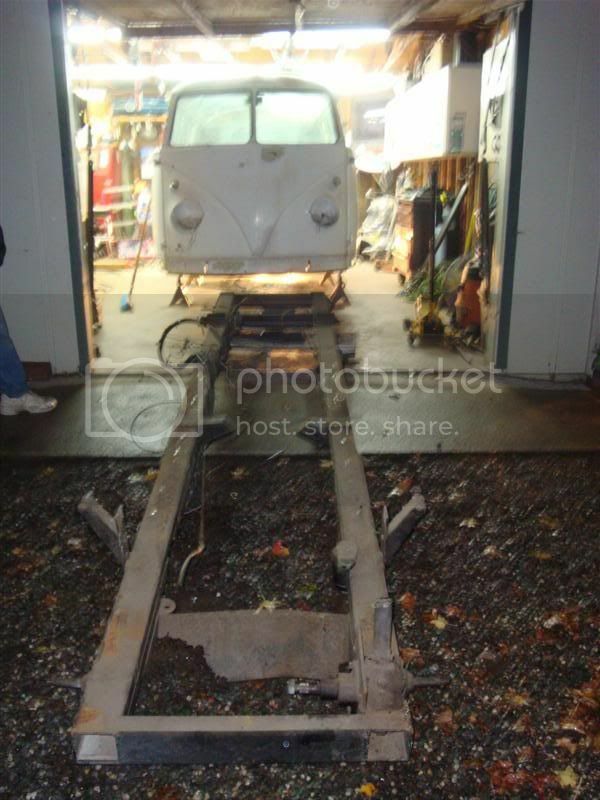 Yesterday I was able to completly remove the frame just the way it was installed by cutting through all the welds that connected it to the original VW frame after it hit the floor it took two of us just to drag it out of the garage. 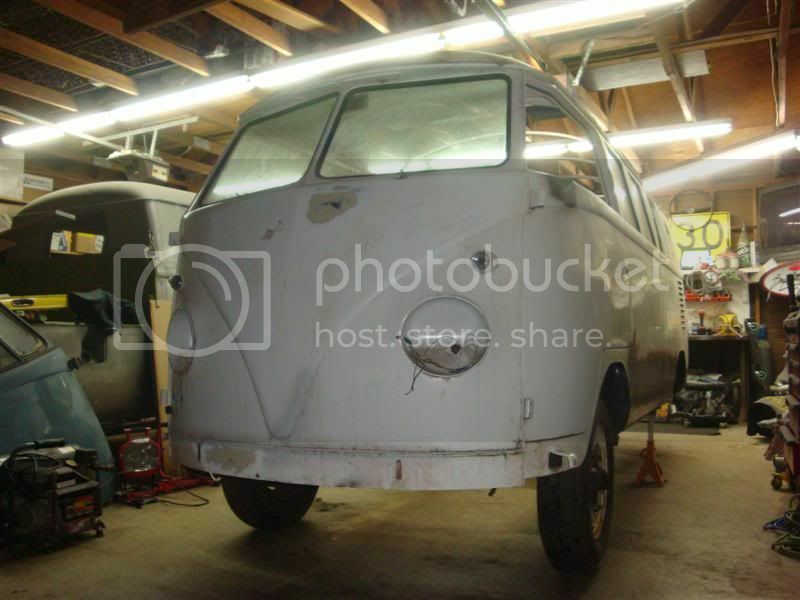 After it was out of the way I was able to tap out the bolt holes for the beam and thanks to mike for meeting me a OCTO with a complete front beam the bus is now sitting on the ground with a set of original 15 inch bus wheels for the first time and years. 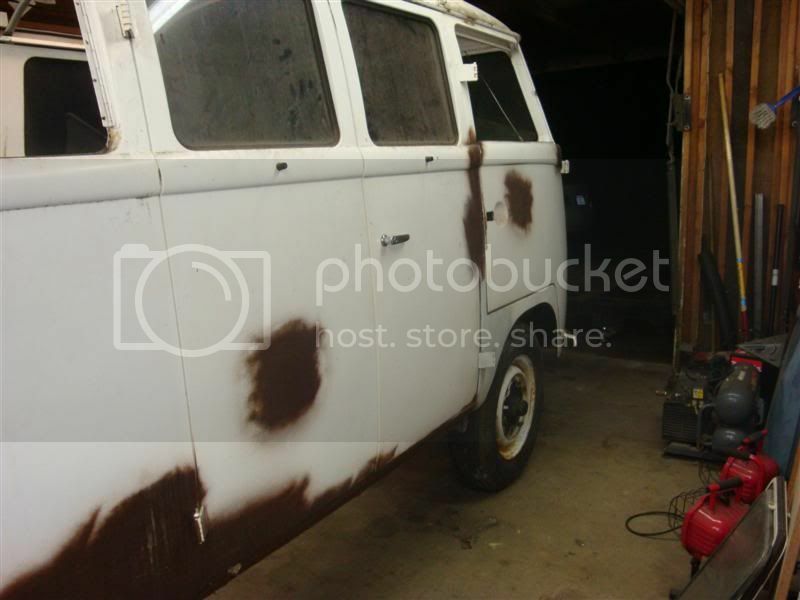 My plan for this bus is very simple since there is no rust anywhere to be found I will repair every last modification that was done to it with as much original german metal as I can thanks to Jadd (smoothfinishes) for a 56 donor bus that has all the lower metal that I should need. After all the metal work is done I plan to return the bus back to stock no plans on lowering this one So stock running gear is what will be installed and thanks to going to OCTO I already have a good complete early front end and split case transaxle with reduction boxes for the bus just need to decide if I want to go with a 1600 or a 36hp engine. 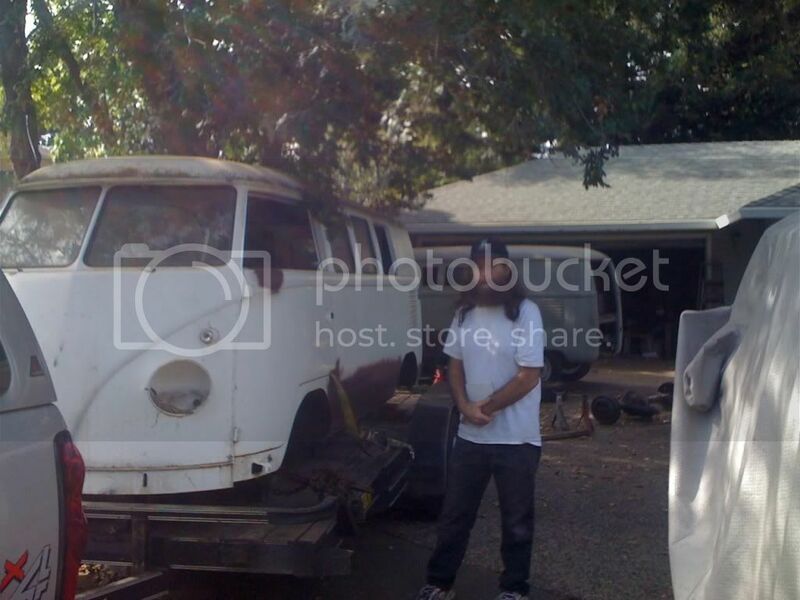 Here is my friend Dave (Campy) the PO of the bus. Here is the progress I have made so far. 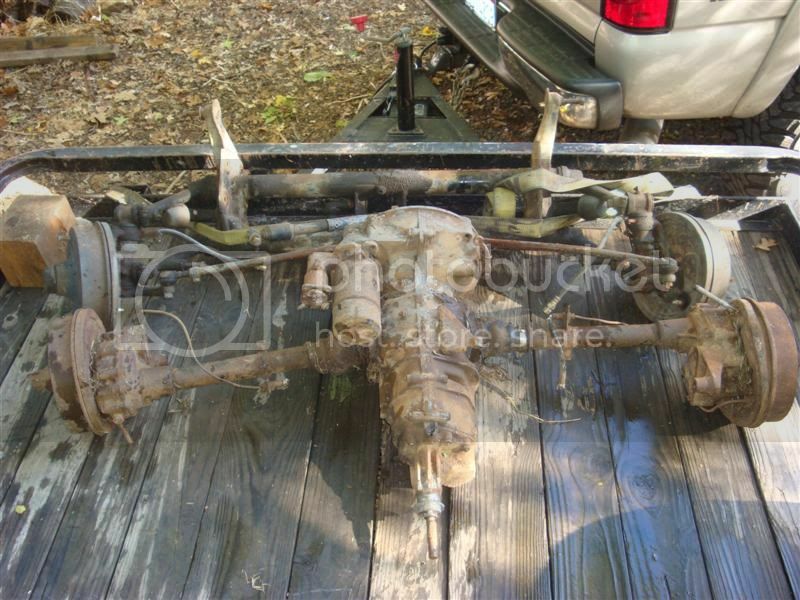 Here is the jeep frame removed. 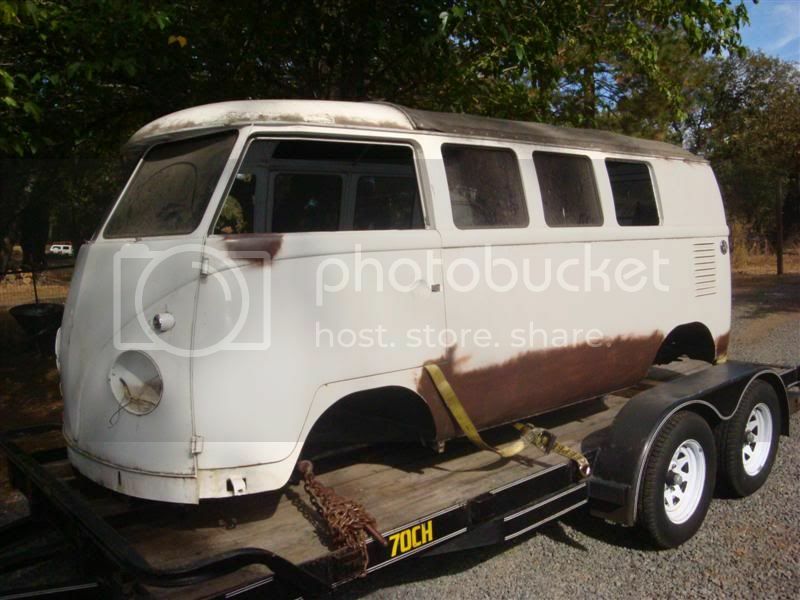 Here is the bus without the jeep frame sitting on a VW beam and wheels. And my score from OCTO. Props to you, Campy, and Jadd for saving and putting this bus right. Looking forward to more pics of the process of putting it back on bus chassis. Any OG paint left on it? Too bad they hacked the driver seat. This could be an awesome rebuild thread, please keep us updated. I thought that you were not going to do a post on it but I am glad that you changed your mind. This is the type of post that i like to follow. Since I have to take care of my mother, I was never going to be able to finish the work, and I thank god that you bought the body and will do the work that needs to be done. Epic thread. Cant wait to see this bus when its debut'd. Wow, that is some project. 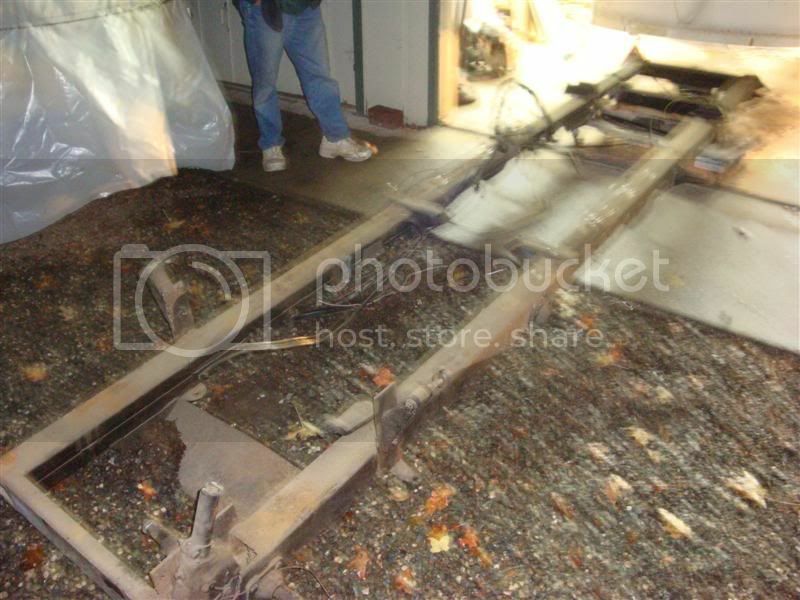 That bus mus weigh a ton less with all that metal yanked out of it. If you are running a split case you have to run a 36hp engine. You can modify them now to put out over 40 horses making them able to at least go 60mph. That's what I did with my '58. In fact, the gearing on that split case trans won't let you go over 60mph anyway without raising a ruckus. I have a split case and 1679. 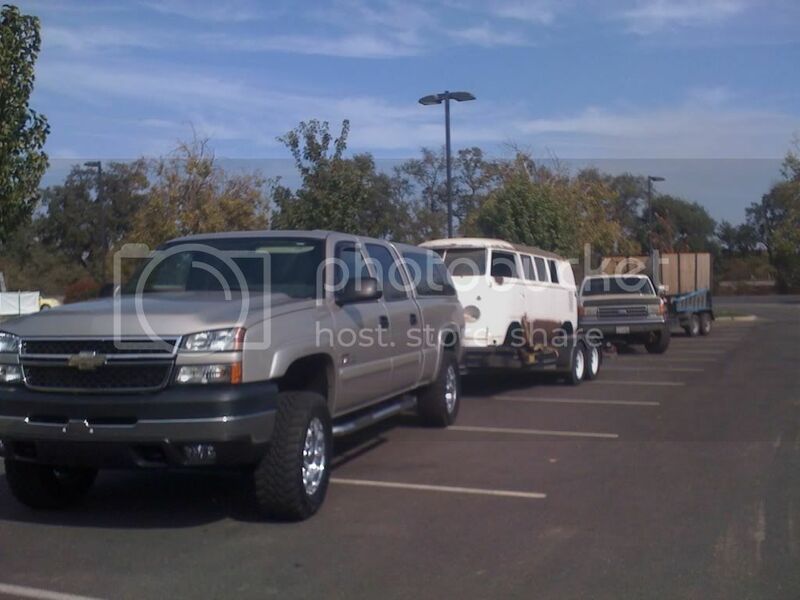 Its great, could fricken tow a train. But yeah, 60 mph with 670s is 3800 rpm, and 65 is 4k. So i stick with about 62 mph. Thank you guys for taking the time to post that information. My plan is to buy a 36 hp and I really dont care to much about the freeway speed if I want to go fast I will drive another one of my VWs. 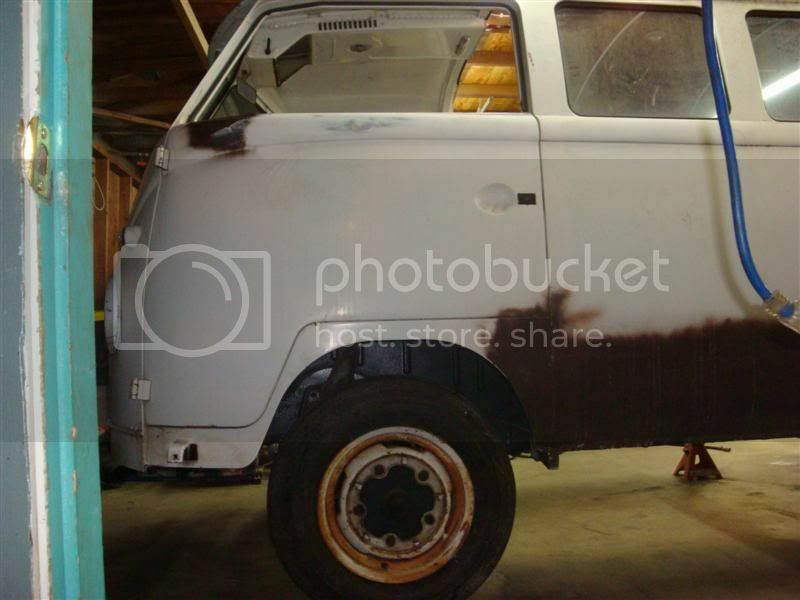 For me keeping this bus stock was never a question and sitting here the thing I cant wait to buy is a set of biasply tires for me thats rare Also to touch base on the OG paint I dont thing saving it is going to be possible. 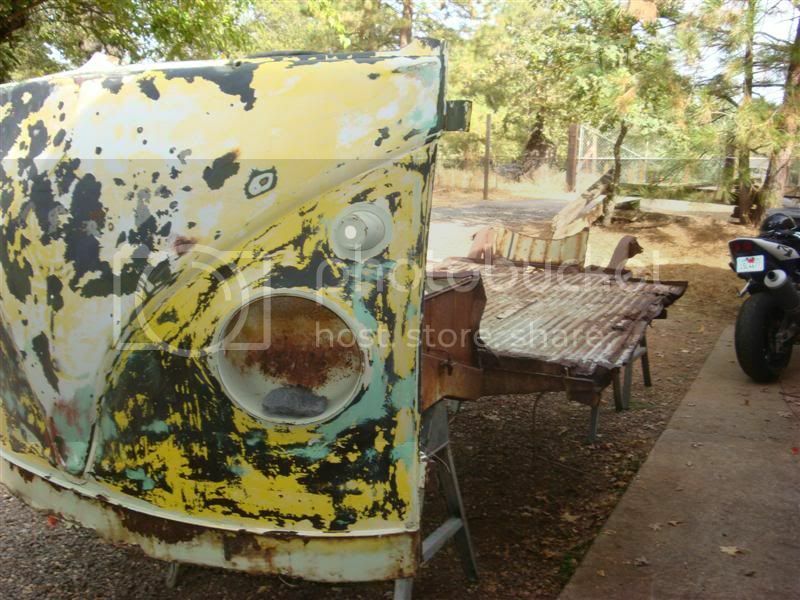 I have tried everything under the sun to remove that white paint and nothing phases it so a new paint job might be in order. 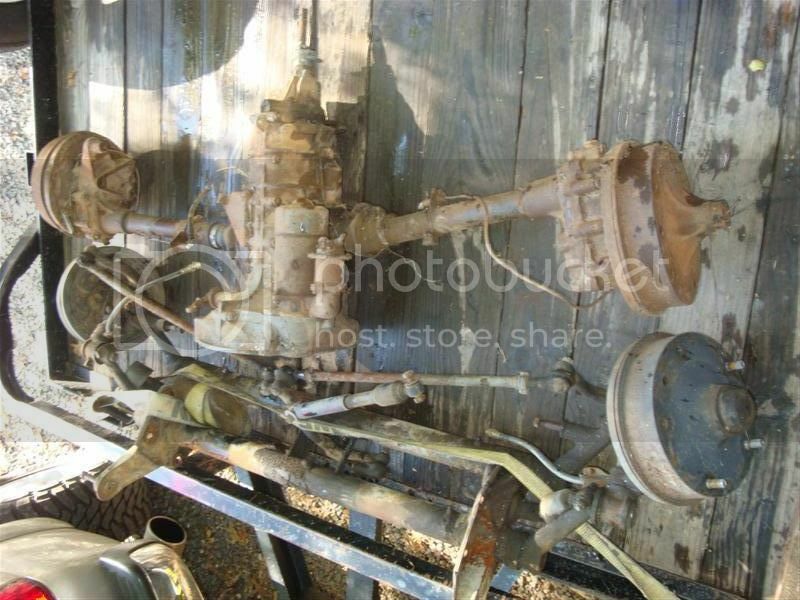 I got two 36hp core motors chillin in my backyard if you interested give me a holla. let me know if you need to know what is stock/correct for the bus. my '58 walkthrough standard is complete. the interior panels for the walkthrough section are unique to '58s, as is the spare tire nut. I have a question: did '58 standards have coat hooks? If so, where and what style? I think that might be the only thing I am missing on mine. nope. coat hooks only came on deluxes. Cool. One less thing to spend money on! Thank you Lind I appreciate it... The one question I have now is what engine lid and apron should I have. 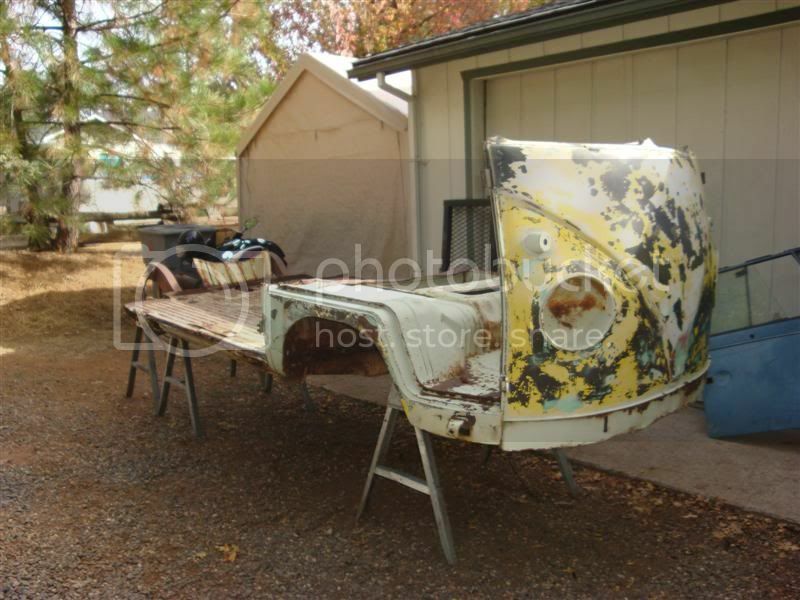 Flat style engine lid ?? Crank start apron ?? it definitely should have the lipped lid. crankstart apron also. What vin did flat stop??? ?